Say it ain’t so, West Hollywood! 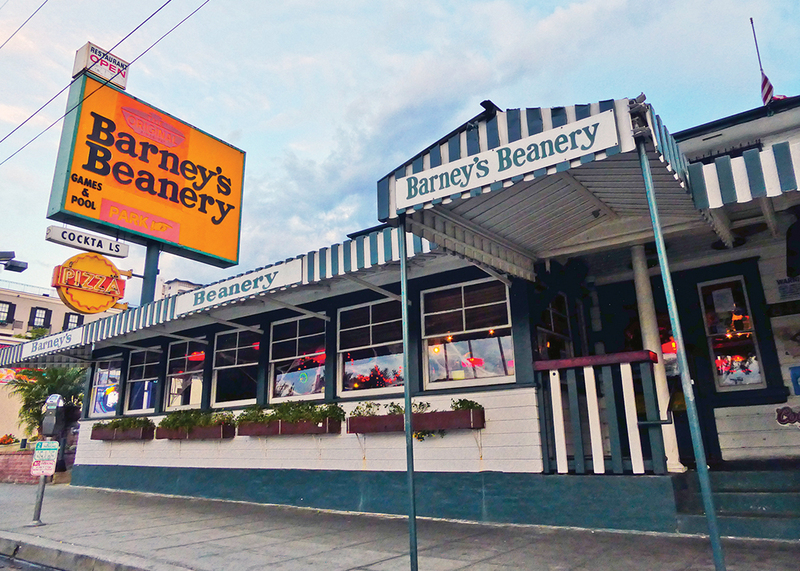 We’re told the venerable Barney’s Beanery restaurant is going to be displaced soon by a new upscale hotel. Plans call for the 89-year-old landmark to be disassembled and eventually restored on the same property during the construction of the five-story boutique hotel. But many longtime customers are skeptical that their favorite haunt will someday return as the same unconventional homey spot that it is today. 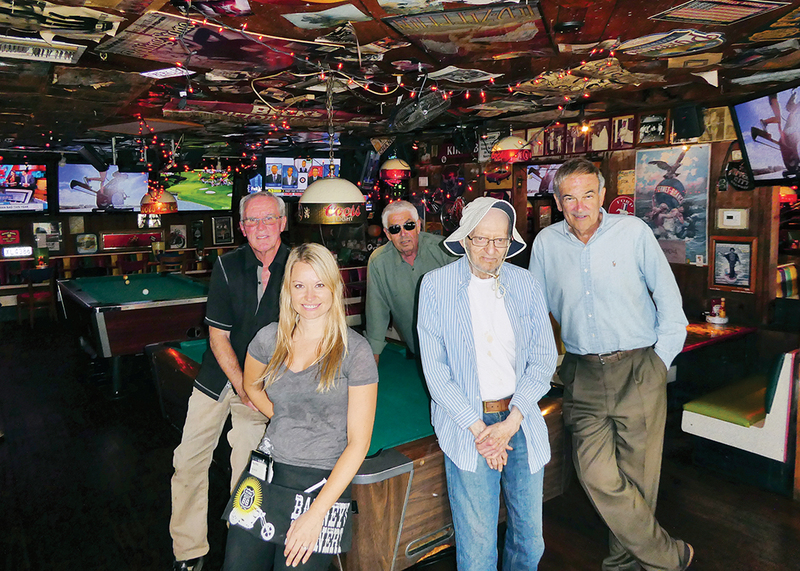 Barney’s Beanery in West Hollywood may soon be gone. Our monthly lunch club decided that we’d better make a trip there before the construction crews dismantled our booth. The Times’ story categorized Barney’s as a “famous greasy spoon,” but we remained undaunted by that label as we pursued our mission of unearthing our city’s restaurant history like the true dining anthropologists we have become. And indeed, there is history aplenty at Barney’s since its opening in 1927, which was built along the newly constructed Route 66. Many Hollywood stars have paid a visit to the old roadhouse in intervening years. Marlon Brando, Rita Hayworth, and Jack Nicholson were among those who called this unique watering hole their hangout. I had remembered how noisy Barney’s can be during its busy dinners, and in my younger years, I would likely have described the place as a fun and rowdy meeting spot. But these days, I find that its raucous atmosphere sometimes offers all the charm and ambiance of Terminal Six at LAX. However, we found the lunch crowd considerably less rowdy and actually sedate by its nighttime standards. Among the one thousand menu items offered, I had read that actress Marilyn Mon- roe had been fond of Barney’s famous “Classic Chili” back in the day, so Norma Jean’s favorite was a good enough endorsement for me. Our pal Arnie, who was formerly known as “the burger king,” has recently broken away from his old ordering patterns and decided on the chicken tostada. Barry chose the “Italian Chopped Wrap” and Josh ordered the New England clam chowder. It took all four of us to open the wrapper of Josh’s oyster crackers and after an extended wrestling match with the stubborn package we needed a long nap. Our gracious server Whitney was a good sport and tolerated our silliness. The attractive Arkansas native posed for pictures with us at the pool table while the gentlemen at an adjacent booth awaited his photo-op with her. We decided that she knew the routine at Barney’s well and had dealt with much more challenging groups than our own. We topped off our lunch with a slice of the house favorite “Warm Apple Pie” with melted cheddar and ice cream—accompanied by four straws. Before our sated group waddled out to the parking lot, we toured the various nooks and crannies of the old roadhouse for the last time and studied the collection of eccentric memorabilia mounted on the walls and ceiling that celebrates memorable West Hollywood history.